Home | Newsletter 159: We Deserve Better! The TPP Doesn’t Work for Most of Us and We Deserve Better! The Trans-Pacific Partnership (TPP) is expected to bring a net, but marginal, boost to the economy, according to a new study. We can expect a loss of manufacturing jobs but the sector expected to tip the balance in favor of a boosted economy is food and agriculture. Unfortunately, the high risk to public health and the environment that will accompany this boost cancels out any marginal benefit it may bring. It is not your local farmer with a small, diverse, sustainable farm that offers your summer CSA share who will benefit from the TPP. The segment of the food and agriculture system that will benefit if the TPP is passed will be the large-scale industrial machine. These are the massive farms growing commodity cash crops which rely heavily on inputs such as genetically engineered seeds, fertilizers, and pesticides–practices that studies show are contributing to climate change. Because the TPP is so detrimental and unpopular, it looks like supporters will try to sneak it through Congress this fall during the post-election lame duck session. 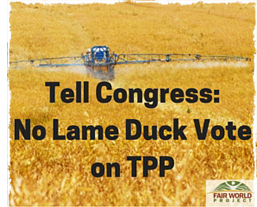 Take Action:We need to stop the TPP and that means no Lame Duck vote! Refusing to negotiate a contract can only mean you are attempting to maintain unfair wages and conditions. I love berries but I will give them up until these workers are paid a fair wage and I will gladly pay more for the berries to make this happen. My father worked with migrant farmers in the 60s to ensure they had good living and working conditions and that they were paid for their labors. Why is this still an issue almost 60 years later? I am a buyer for a retail grocery store, and we will absolutely not be purchasing any Driscoll products until a fair contract with FUJ is in place. Thank you for your prompt attention to this issue! 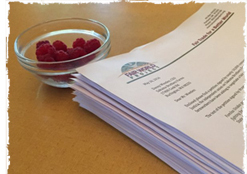 At the same time, we also sent a letter signed by over 30 organizations to Driscoll’s, a partner of Sakuma Brothers, asking them to reinforce their own worker welfare standards. We want to be clear that a right to freedom of association and collective bargaining is meaningless if organized farmworkers cannot secure a fair contract! Thank you for supporting farmworkers asking for a fair deal. Read the press release for more information! World Fair Trade Day, May 14th, is one of our biggest annual outreach efforts. We bring together natural food stores and dedicated fair trade companies for a month of educational & promotional activities focussed on making our food system more fair for farmers and artisans around the world. Seven lucky people won a year’s supply of their choice of some of the top fair trade brands around: Alter Eco, Alaffia, Dr. Bronner’s, Equal Exchange, Farmer Direct Co-op, Guayakí Yerba Mate, Maggie’s Organics, and Theo Chocolate. 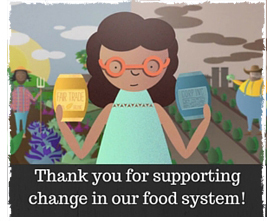 Big thanks to everyone who watched and shared our newest video, The Fair Trade Story, produced for the occasion. If you missed it, check it out on our site to learn more about how you can support fair trade every day. San Francisco public schools take first step toward implementing a Good Food Purchasing Policy. Regenerative farmers put carbon back into soil. Meat eaters have best chance of changing our system of animal agriculture for the better.